Dinner with Paul and Staci Arney, The Ale Apothecary, will be a magical night limited to 16 people. This 4 course and 10 beer dinner will offer a unique opportunity to dine amongst the walls of bottles at Corvallis Brewing Supply, with the most imaginative brewer Oregon has ever seen. Paul and Staci Arney set out, in 2011, with a pioneering spirit, to create a brewery so unique and so special that their original idea would be an obvious copy cat right away! For the dinner, Paul has selected mostly library beers that are no longer available for purchase. Combined with a leisurely two hours of dining and conversing with the Arneys this will be a beer lover's dream date! 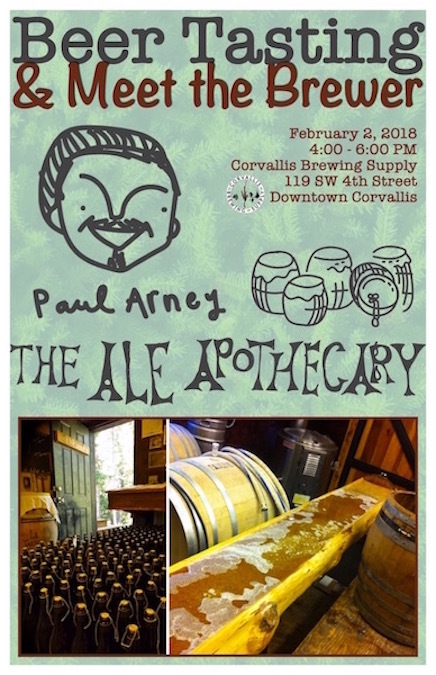 Corvallis Brewing Supply is pleased to be on of just a handful of bottle shops that can offer The Ale Apothecary beers and even happier to have the Paul and Staci for an event like this. Please join us! To RSVP for the $75.00 affair, we require a $20.00 deposit before Thursday, February 2nd at Noon. We will also be offering diners 20% off Paul's beers and it will include one of his amazing goblets for your at-home drinking pleasure! Please call at 541.758.1674 or stop by the shop.